If you'd like to get your foundation problem repaired permanently, you'll first need to know exactly what's needed for your unique problem. At Dry Pro Foundation and Crawlspace Specialists, our team of trusted in-house foundation repair experts is here to help. We have the training, experience, and warrantied foundation repair products you need to solve your foundation problem. If you'd like to meet with one of our foundation repair experts for a home inspection, consultation, and written foundation repair quote, contact us today! Each of our foundation repair quotes comes completely free and at no obligation. We use foundation repair products that have been designed, manufactured, and distributed by Supportworks, Inc., an international network of more than 100 of the most experienced structural and foundation repair contractors in North America. Supportworks' team of in-house structural and geotechnical engineers have carefully designed, tested, and patented foundation repair solutions for repairing foundation problems of all types. Each of our products is based on time-honored solutions that meet all local and international standards. The walls in this basement have been damaged by excessive water and moisture exposure. The integrity of the walls are also compromised by expanding soil from outside the home. Dry Pro installed Carbon Fiber strips to add stability to the walls. Dry Pro Foundation and Crawlspace Specialists was called out to see why our customers garage side entrance door was stuck and would not open. When our System Design Specialist arrived, he noticed right next to the door there was significant cracking in the brick where a section of the garage was sinking into the slab. There was also a lot of settling in the driveway which caused sections of the concrete to crack and become uneven. Dry-Pro installed 2 Helical piers to close the gaps in the brick wall and injected our Poly-Level product under the slab in the driveway and garage floor. The garage floor and sections of the driveway were raisin back to their original height and now look great. The homeowners were extremely happy knowing they can now open and close their garage entrance door without the concern of it getting stuck. Komee, a member of the US Airforce, had two large humps in the floor of his home. Kelley, with Dry Pro, came out to assess the issue. It turned out that the joists and girders were the sources of the problem. We solved this for Komee by reconnecting the joists and installing SmartJacks. This crawlspace floor was exposed to excessive moisture causing damage to the support joists. Dry Pro came in and replaced the beam and also installed a new waterproofing system to prevent further damage to the structural foundation. Bill's home had stair step cracks in the brick foundation. He called Dry Pro interested in having his foundation evaluated and getting a new crawlspace door. The Dry Pro Crew went out and installed a new crawlspace door, three helical piers, three SmartJacks, and four Heli-Ties with touch pointing. In the photos you can see the difference between the two crawlspace doors. The new door not only looks better but it will also keep troublesome intruders and outside air from entering Bill's home. Robert in Valdese, NC was experiencing sagging floors in the middle of his house. He was concerned the beams under his home would need to be repaired or replaced. Our sales rep informed him of a less invasive approach. The Dry Pro Team used a Smart Jack, CMU Piers, and Sistering Joists to level the floors in Robert’s home. The after photo shows the Smart Jack in action! At Dry Pro Foundation and Crawlspace Specialists, we bring that warrantied, proven quality straight to your door to repair your foundation. Contact us today to schedule your free quote for your foundation repair project. "I found Dry Pro on-line and chose it because of the..."
"Every person I dealt with at Dry Pro was extremely..."
"Best deal for the money"
"Best installers ever! Definite asset to your company"
"DRY PRO's saleman Kelly Dragstrum gave us all the info we..."
We Have Simple, Permanent Foundation Repair Solutions For Your Foundation Problems at Charlotte! For our foundation repair contractors, a typical home foundation repair usually takes less than a week to complete. All of our systems come with a written warranty -- so that you know the problem was fixed right, and so you can have peace of mind for many years to come. Issues like stair-step foundation cracks, buckling walls, and sagging floors can be devastating to your home's value and make you feel bad about the way your home looks and feels. Our foundation repair systems are designed to do more than just permanently repair your home foundation -- they're also designed to return your structure back to its original position. Regardless of why you're experiencing a foundation problem in your home, Dry Pro Foundation and Crawlspace Specialists conducts a thorough inspection of your home, and we'll let you know exactly what steps need to be taken to permanently stabilize your foundation and restore value to your greatest investment. Foundation walls begin to bow and buckle inward when the force against them exceeds their ability to withstand this pressure. Failing foundation walls will crack and leak, and if you have a finished basement, they can lead to cracks in the finished walls. Bowing walls may eventually collapse and should be addressed right away. We repair bowing walls from the outside with our Geo-Lock Foundation Wall Anchor System. When outside access is not possible, we recommend our PowerBrace™ I-Beam System. Our solutions will do more than simply stop inward movement -- they can also be used to straighten the walls back to their original position. Learn more about bowing, buckling walls. Foundation settlement occurs when the soils underneath a foundation are unable to support the weight of the structure that's resting on them. A settling foundation will mean a great deal of damage to your home -- including cracked foundation walls, cracked drywall, doors and windows out of square, and tilting chimneys. 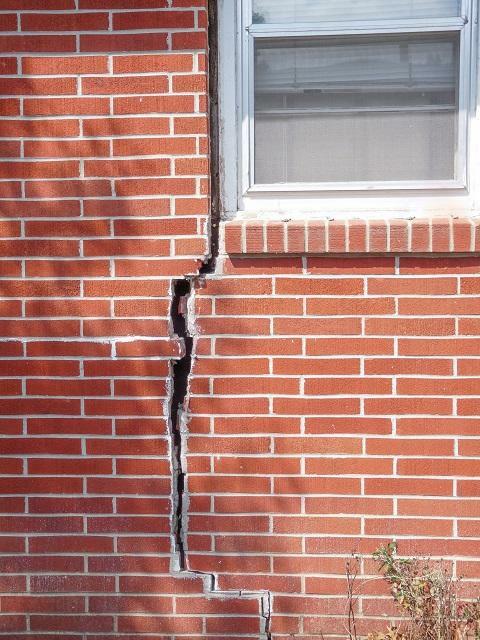 As foundation damage goes unaddressed, it will become more difficult to repair. Supportworks' line of foundation piers are a great option for repairing sinking structures of all types. These sturdy, corrosion-resistant piers can stabilize and lift your foundation back to a stable position -- permanently! Learn more about foundation settlement. Floors over crawl spaces begin to sink in three scenarios: When there are too few supports, when the supports begin to sink into the ground, and when the structural wood holding up your floor begins to rot and grow mold. When crawl space structures experience settlement, the entire home above can begin to show damage. Drywall will crack, doors will stick and floors will become uneven. If the crawl space is damaged by mold, there may also be moldy, musty odors upstairs. Rugged steel supports like Supportworks' SmartJack® Crawl Space Support System can quickly restore your structure. If your structure was sinking due to mold and rot, your crawl space should also be dehumidified and encapsulated to prevent further damage. Learn more about sagging crawl spaces.